The One Movie Blog: Train of Thought: Tourism, Travel, and the Self-Conscious Spiritual Journey of Wes Anderson’s "The Darjeeling Limited"
Train of Thought: Tourism, Travel, and the Self-Conscious Spiritual Journey of Wes Anderson’s "The Darjeeling Limited"
A taxi hastily makes its way down a narrow city street in an overhead long shot that soon movies in a zipping, zooming motion to meet the car head on, destabilizing the viewer and isolating this small vessel in a sea of stereotypical exoticism that, the soundtrack informs us through the shorthand of the theme from Satyajit Ray’s Jalsaghar, must be India. Throughout the scene, the business-suit-and-fedora-wearing passenger, played by Bill Murray, alternates nervous glances at his watch with nervous glances at his surroundings as he’s jolted the backseat of the tiny cab, whizzing through colorful, crammed South Asian scenery full of pedestrians, animals, buildings and cars that present nothing more than obstacles on a hurried drive to the train station. It’s clear he’s on a time table, not taking in the environment as much as moving through it as fast as he can, the tension increased by jumpy, jagged juxtaposition of quickly traveling shots. There is something specifically American in Murray’s appeal, and seeing him in the opening sequence of Wes Anderson’s The Darjeeling Limited only works to further emphasize the foreignness of the setting relative to its protagonists. Charting unknown territory no less than in the director’s previous film, The Life Aquatic with Steve Zissou, Murray’s unnamed character presents a stereotypical image of the privileged, white, insensitive, ignorant American abroad. Of course he is late, and when the cab driver pulls into the station, Murray runs away without paying and, barely looking back at the people behind him, cuts the line at the counter to buy a ticket, all before breaking into a sprint after the moving train, in the first of four of Anderson’s signature slow motion processions in the film, this one to the Kinks’ elegiac “This Time Tomorrow.” As he awkwardly strives forward he’s slowly overtaken by Adrien Brody’s character, who enters frame and film from right, outpacing Murray and clambering aboard the racing titular train as Ray Davies wonders “This time tomorrow where will we be/ On a spaceship somewhere sailing across an empty sea… This time tomorrow what will we see/ Field full of houses, endless rows of crowded streets/ I don’t know where I’m going, I don’t want to see/ I feel the world below me looking up at me/ Leave the sun behind me, and watch the clouds as they sadly pass me by/ And I’m in perpetual motion and the world below doesn’t matter much to me.” The sequence is undoubtedly comedic, but there is something mournfully poetic in the use of music, in Murray’s silent, defeated figure, slowly receding into the background as the train passes him by, and in the soft, bittersweet smile that plays on Brody’s lips as he watches the older man left behind, a soulful and ultimately sad expression that will take the rest of the film to explain. What Brody’s Peter and his brothers, Francis (Owen Wilson) and Jack (JasonSchwartzman) Whitman, must leave behind in Anderson’s film is not only Murray’s surrogate father figure—the actor’s notable and surprising absence throughout the rest of the movie shadows the absence of the Whitmans’ deceased father—but everything that this peripheral character represents. The central trio of wealthy white Westerners embarks on a (very self-conscious) spiritual journey across India by rail not merely for the sake of seeing the world, but also for the healing of personal ailments. Their journey, at first nothing more than a forced family march to enlightenment, complete with laminated itineraries and detailed user instructions for spiritual rituals, combines an exploration of traveled space with an investigation of psychological processes of change and transformation. The brothers’ displacement and entering of a new territory is specifically what prompts the characters’ reassessment of their own existence, encouraging them to rethink their worldviews and paradigms and move, significantly, towards the creation of a new community. By the end of Anderson’s film, The Whitman brothers will have stepped away from the safety of home, the familiarity of objects, the security of material comfort, and the need to plan and control everything around them; they stop being tourists and become travelers. In embracing the danger of uncertainty and the possibility of community, in their family as well as with the Other, they go against typically Western notions of rationalism and individualism to begin to understand and accept a new way of life. If the ultimate conclusion of the trip sounds hackneyed or simplistic, one must understand that the blatant—and blatantly, self-consciously clichéd—nature of Anderson’s exploration of the journey theme is ironic and intentional. Francis’s explanation of the purpose of the brothers’ cross-country journey in the beginning of the film (“A: I want us to be brothers like we used to be and to find ourselves and bond with each other. B: I want to make this trip a spiritual journey where each of us seeks the unknown, and we learn about it. C: I want us to be completely open and say yes to everything, even if it’s shocking and painful”) is delivered to Jack and Peter while directly facing the camera, and thus the audience. This is a performative gesture that sardonically acknowledges and engages with the audience’s genre expectations of the road movie. In “Balancing Act: Exploring the Tone of the Life Aquatic with Steve Zissou,” John Gibbs identifies the four dimensions of tone as the film’s attitude towards 1) its characters and subject matter, 2) its audience; 3) the conventions it employs or invokes; and 4) the film as film (137). This structure is helpful as we discuss the self-reflexivity of The Darjeeling Limited. Anderson and the audience are fully aware of the clichéd nature of the film’s spiritual journey. Yet the characters themselves are completely and genuinely invested in the pursuit of their emotional fulfilment within the film’s diegesis, even as Francis is situated, from the very beginning, as a self-referential character performing these viewer expectations. The constructed nature of the dialogue and the deadpan performance style of this scene are consistent with the director’s cinematic milieu and self-reflexive engagement of the tourist-traveler dichotomy employed in the development of character. “This genre of discourse, though deployed in relation to travel, has nothing do to with tourism, either ancient or modern; neither is its orientation such as would simply exploit the figure of travel as a metaphor for the movement of development of philosophical thought. Rather, the travel to which such writing submits takes place as a discovery of evocative places, of places that, because they are evocative, give focus to the visit, in contrast to the accelerated distraction of tourism” (1-2). This “accelerated distraction of tourism” is precisely what the Whitman brothers are engaged in throughout roughly the first half of the film. Three greedy tourists grabbing at epiphany, they go from one Spiritual Place to another, ringing bells, kneeling, praying and donning ridiculously undersized ritual head-wraps all in an attempt to heal their emotional and, in Francis’s case, physical wounds. Carefully planning and trying to control everything through a preposterously over-detailed schedule leads, paradoxically, to a state of passivity in which the characters become objects stripped of agency. This is perhaps less obvious in Francis’ case, because he, or, more appropriately, his assistant Brendan, is the one making the itineraries. But Jack and Peter are, by Anderson’s own admission, just following along. “I feel like two of the brothers have just sort of been assigned to go to India,” the director has said in an interview. “They’ve been told, ‘Here are your tickets, here’s where you need to be, just follow this path and you should end up in this compartment. You’ll find me there.’ I don’t think these brothers are exactly the most open-minded to the world” (Seitz 208). The filmmaker tells the story of a friend who used to travel all the time and kept detailed journals which he called “The Musings of a Completely Unfeeling American Abroad.” He never allowed the experiences and information he gathered on his journeys to change his worldview or enter into his daily life in any way; he refused to change or adapt to the places he visited. According to Anderson, the Whitman brothers are, similarly, as a group, “pressing right through the middle of it, and they’re kind of interested. They like the idea of picking up a little of this and a little of that, but they’re not studying it for long. They’ll just put it in their suitcase with the rest of their stuff. And it takes them a lot to really open their eyes, because they’re very fixated on their own problems. They’re just very selfish, narcissistic people” (Seitz 209). The first half of the characters’ trip is almost like a shopping trip to India. In one scene, that is literally what it is, when they go to the bazaar near the Temple of 1,000 Bulls. The scene starts with a slow panning shot of the scenery and native villagers before the camera moves down to reveal the brothers arriving at the temple in an overhead shot and then quickly zooms in on them, all but eliminating the background, a bustling picture of marketplace activity. Here, as in many other sequences of the film, the camerawork and spatial positioning of the main characters in relation to their environment communicates their dislocation and separation from their surroundings. The Indian people are literally and figuratively placed on a different—in this case, higher—level than Francis, Peter, and Jack, and the zoom serves to further isolate the characters from what is around them, and perhaps to suggest the ways in which they, themselves, isolate themselves and block out their environment. Introduced by Francis, as “one of the most spiritual places in the entire world,” the temple holds the characters’ attention for the whole of three seconds before they turn around and go about buying different items, Anderson underlining the brothers’ commodification of India into a series of products they can purchase. The Darjeeling Limited brings up questions of the authenticity of the brothers’ experience in a way that negotiates some of the crucial ideological anxieties and contradictions around traveling, most significantly the image of the undertaker of a journey as both explorer and explored , simultaneously an active observer and what Dimitris Eleftheriotis, in Cinematic Journeys: Film and Movement, calls a “parcel” (77). In works such as Wolfgang Schivelbusch’s The Railway Journey: Trains and Travel in the 19th Century and David Harvey’s The Condition of Postmodernity: An Enquiry into the Origins of Cultural Change, modern means of transportation are discussed in the context of the construction of a type of movement that seems to depersonalize, if not annihilate, space itself, reducing the world to a series of destinations and the traveler to a passive, indifferent package that is shipped and received. Taken even further, the train itself, through its fixed, linear movement down the tracks provides a narrow, neatly ordered and pre-planned version of travel that is not conducive to the brothers’ emotional progress. This reading of the Whitman brothers as parcels moved from one location to another without any will of their own seems especially appropriate in the context of Anderson’s work, in which the line between character and setting is so often blurred. Stefano Baschiera has gone as far as to suggest Anderson in effect overcomes the separation between subjects and objects, human and non-human (118). As Thomas Dorey observes in “Wes Anderson: Contemporary Auteurism andDigital Technology,” the director links his characters and the objects that surround them not only thematically, but stylistically as well through the use of his most easily recognizable visual signature, the inserted God’s-eye close-up. Shot from above, the actors begin to look like objects themselves, their agency removed as their authorial dominance undermined (68-71). In Darjeeling, the most memorable of these inserts happens not only when the brothers are at their lowest point—about to be evicted from their temporary “home,” the train, but specifically while they are fighting about objects, the familiar things they have chosen to cling to for control and security in the face of uncertainty, so much so that the first items they lose, Francis’s belt and shoe, are not discarded willingly, but stolen from them. 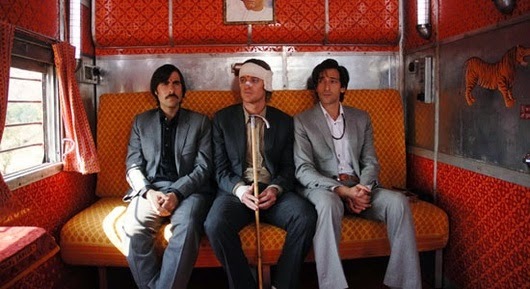 Similarly, it is not of their own free will that the brothers leave the luxury hotel on wheels that is the Darjeeling Limited, making the film’s title superfluous. Reprimanded like unruly children for bad behavior, they get kicked off in the middle of the countryside, away from the security of laminated daily timetables and of material comfort, “where they might enjoy the sort of unmediated revelation you just can’t plan with TripAdvisor,” as Jonah Weiner writes in the Slate article “Unbearable Whiteness: That Queasy Feeling You Get When Watching a Wes Anderson Movie.” Although meant sarcastically, Weiner’s point resonates with ideas of passivity and agency central to the understanding of the tourist-traveler dichotomy. In the beginning of the film, we see Peter ascend through the various classes of the train, passing—and probably, like Murray’s character in the opening sequence, not noticing—the people and animals on the train as he makes his way through the luggage car and coach before arriving to the comparably lavish private sleeper that Francis has reserved for the trip. This compartmentalization on the train only expands the gulf between the Whitmans and the space around them as well as the people who inhabit it, supporting the preservation of their individualism at the expense of community. Only when they leave the train and let go of its relative safety can they become active participants in their own spiritual journey. Supposedly, the characters have left the city to enter a diegetic world that goes against and beyond the conventional, everyday, regulated and sheltered life at home, an environment which the train only simulated. 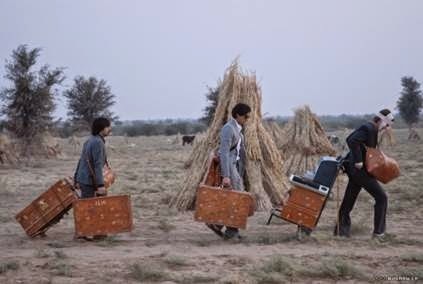 Following the brothers’ eviction is a long tracking shot of them walking through a field at night; we come to realize this is the first time we’ve seen them walking in the entire film, actively going through the most basic and fundamental action of any journey instead of simply getting delivered to different places by rail. In Getting Backinto Place: Toward a Renewed Understanding of the Place-World, Edward S. Casey writes that “legwork is the main means by which a journey is accomplished. Whether on a long-legged horse (e.g. Don Quixote and Sancho Panza, or the legendary Crusaders) or literally on foot (e.g. Dante and Virgil), the journey is made by maintaining bodily contact with the underlying earth” (276). This contact with the earth, the literal touching of the ground as they travel on foot in Darjeeling also comes to represent a deeper connection with the space and land that the characters travel. Anderson places the three brothers in situations which test their certainties, preconceived ideas and beliefs, and their comfort. The change of environment and the physical act of moving through space propels characters again and again towards self-discovery, the exploration of new places revealing well-hidden emotions, memories or traumas. This inadvertently brings to the forefront anxieties of mastery and control as the travelers are pushed out of the comfort and stability of the home (or the train) into unknown and uncertain territories. Cees Nooteboom describes the fascination with the unknown, with standing “at the edge of the Sahara” in Nomad’sHotel: Travels in Time and Space as “The same old sense of excitement. This partial loss of self is expressed most obviously in Darjeeling in the characters’ renouncing of their possessions and their decreasing levels of material comfort. At first, the brothers are unwilling or unable to fully accept or become immersed into their new surroundings, holding onto the familiar and the comfortable, namely their belongings, which they lug around in their dead father’s suitcases, blatant, boxy, bulky Marc Jacobs-designed metaphors for emotional baggage. “There are these sorts of talismans the brothers carry—things like a pair of sunglasses or music box or the father’s luggage, and these various objects that a character is placing around the room at a certain point,” Anderson has stated. “They affix a meaning to each of those things. Sometimes when you’re traveling, you do that. When you’re going to be away for a long time, I find you tend to put the things you’ve decided are your familiar objects around you” (Seitz 205). The sense of dislocation associated with the loss of a parent, the key trauma of the three brothers, is only heightened in the film by the characters’ being in motion, away from home, in a foreign country (Baschiera 127). The expensive clothes and accessories the three brothers own not only display their social status, but help the audience visualize their profound displacement in this new environment. The color of the characters’ clothes, for the most part muted and monochrome (gray, black, white, tan, and beige) stands in stark contrasted to the exaggeratedly bright, supersaturated surroundings that burst with warm, lively yellows, oranges, and reds and vivid greens and blues, an imaginary, candy-colored cinematic India of the mind. Anderson’s carefully chosen color palette creates an environment that is brighter and more enhanced than reality, imbuing the film with an often remarked upon “dollhouse” or “chocolate box” effect that adds to the level of artifice even as it creates a romanticized, fetishized view of the land; this is not a real country—the same way none of the director’s other near-maniacally meticulous, color-coordinated, carefully framed and trinket-filled worlds can be thought of as realistic—but a foreign place accessed through (or made up of) completely mediated images: Jean Renoir’s The River, Louis Malle’s documentaries, and the films of Satyajit Ray, a construction of place that denotes a distinctly middle-class, Euro-centric nostalgia (Wilkins 35). The train itself, like the titular location in Anderson’s Hotel Chevalier, suggests a past bourgeois era, as do a number of different objects presented throughout the film: Jack’s girlfriend’s Voltaire#6, a French haute couture perfume reminiscent of Chanel No. 5; the father’s red Porsche, a German-produced model; the brothers’ expensive, European-style suits. From an aesthetic perspective, at least, Anderson’s films see products, travel and geography from a clearly Continental perspective. The Whitmans’ individual quest for experience, truth, knowledge or meaning in and of itself articulates distinctly Western/European and modern sensibilities around mobility, vision and subjectivity. Eleftheriotis argues that traveling, “as an essential tool of scientific discovery and the extension of metropolitan imperial power on a macro level, as a way to complete one’s education and acquire valuable cultural capital on a personal level,” becomes indispensable not only in personal pursuits of knowledge, accomplishment or pleasure, but also in providing access to social and cultural power (77). “We rationalists perceive the reality of being members of a community in the reality of works undertaken and realized; we perceive the community itself as a work…. In the public works and monuments of North America we see inscribed the motivations and goals of us North Americans; in our factories, airports, and highways we see our reasoned choices among our needs and wants, and our plans. In our system of laws and our social institutions, we recognize our formulated experience, our judgment, our debated consensuses. In our rational collective enterprises we find, in principle, nothing alien to us, foreign, and impervious to understanding; we find ourselves” (Lingis 5-6). Leaving the security of home and venturing into the unknown carries with it a forsaking of the systems and institutions in which the protagonists have previously found themselves, as Lingis writes. “A potent factor of the undetermined, often of distinct danger, attends the journeyer and eliminates the security of a predetermined trajectory” (Casey 276).The train and the objects they carry represent the Whitman brothers’ last attempts to hold onto the security of that which is familiar, whereas the new environment they have entered, especially after getting kicked off the Darjeeling and no longer passively moving through an organized series of set destinations, is beyond their control, implying an exposure to risk and vulnerability. There is one other element in the Temple of the 1,000 Bulls scene that is easy to miss on a first viewing, but the sheer incongruity of which requires consideration in this context. When Peter goes into another room to pray alone, Anderson places a young boy holding a gun on the right side of a frame. The boy occupies the outer edge of the frame, and the camera zooms in to a closer view of the main character within seconds, cutting the child out of the composition, but the gun remains, protruding within the frame, for the duration of the shot. This could be read as a metaphor of Peter’s fear of his unborn child and a reminder of his father’s death, the last thing mentioned before the scene cuts to him, but I think there are deeper connotations to this sudden, unexplainable presence of violence. Even more so than the mace and the cobra in the earlier scene, the gun becomes symbolic of the threat of the Other, which, try as they might, they cannot completely block out, and the constant danger that surrounds the Whitmans in India, or any traveler in a new and unknown environment, and the fear (and inevitability) of death. The boy and the space he inhabits become one in this scene, to such an extent that his presence is not easily noticeable at first. As Juhani Pallasma notes regarding Andrei Tarkovsky’s work, characters do not appear as persons on an architectural stage; “the space and the characters have been cast in the very same matter, eroding towards its final destiny, a ‘horizontal death” (Pallasma 43). The same concept could be applied to Anderson’s film and this scene in particular, in which the melding of character and space spells an awareness of the inevitability of death. The encounter with the Other, then, is explicitly dangerous in the way it challenges and disrupts the traveler’s comfort and familiarity with a certain way of life: “Before the rational community, there was the encounter with the other, the intruder,” Lingis writes. “Beneath the rational community… is another community, the community that demands that the one who has his own communal identity, who produces his own nature, expose himself to the one with whom he has nothing in common, the stranger. This other community is not simply absorbed into the rational community; it recurs, it troubles the rational community, as its double or its shadow. This other community forms not in a work, but in the interruption of work and enterprises. It is not realized in having or in producing something in common but in exposing oneself to the one with whom one has nothing in common: to the Aztec, the nomad, the guerilla, the enemy”(Lingis 10-11). The author of The Community of Those Who Have Nothing in Common actually takes as his point of departure the mortality that unites all people across racial, religious, economic, geographic, and linguistic barriers. Death becomes the one thing all of us have in common. Similarly, Matt Zoller Seitz points out in his interview with Anderson the constant presence of death or the fear of death as an equalizing force, “the great leveler”(151). The gradual seeping in of a spiritual sensibility, in Darjeeling, Seitz argues, is directly linked to the impact of death and the awareness of mortality. Pointing to the long “dream train” tracking shot towards the end of the film, Seitz sees all of the characters, assembled within different compartments of the train, as fundamentally equal, whether they are rich or poor, because of their own mortality. It is significant that all of the characters are placed, against all laws of narrative logic, in the same space, and shown as connected through the style as well as there are no cuts between the different compartments. The tiger in the bushes at the end of the sequence then then becomes an embodiment of death, Anderson’s grim reaper, a constant reminder of danger and the inevitability of the characters—and our—own demise, something we can neither predict nor control, something which is always lurking, on the loose as the tiger itself in Anderson’s film. The most obvious turning point for Peter, Jack, and Francis’s trip, occurs exactly at the moment in which they come in direct contact with death, and their journey and the film both take a sharp tonal turn. 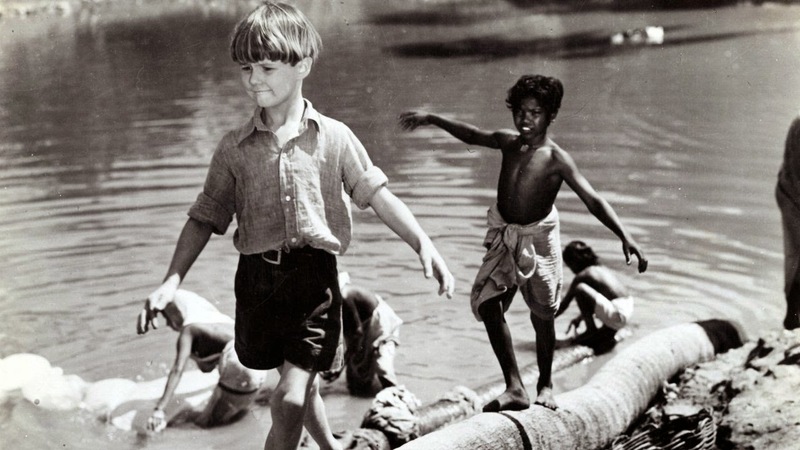 This change, portrayed in the river scene, is announced with an abrupt, shaky hand-held zoom onto Francis’s face as he unceremoniously announces, “Look at those assholes” while peering towards three boys trying to cross a fast-flowing river. The boys’ raft overturns, and the Whitmans race to save the boys. Anderson’s camerawork here has a destabilizing effect on the viewers; we are momentarily jolted and made aware of an abrupt transition. The potential to shock and displace of this zoom is just one example of Anderson’s mirroring, through the movement in and of the frame, of the shock and displacement of the characters’ journey. Movements of exploration and tropes of revelation are separated into two distinct categories in Cinematic Journeys: 1) slow, steady movements that explore space, discover significant objects and lead to dramatic revelations, which seem to echo the perception of change as a steady progression that gradually and incrementally unlocks the mysteries of the world; and 2) fast and unsettling movements that reveal a key dramatic object or narrative situation that echo moments of discovery as revolutions which alter the course of knowledge, destabilizing certainties, revising narrative trajectories and challenging the perceptions of characters and/or viewers (Eleftheriotis 77-81). The brothers’ journey in Darjeeling falls into the latter category. In the river scene, the abrupt displacement of the exaggerated, rapid camera movement towards the characters marks a radical shift in both the movie’s tone and the progression of the characters’ emotional journey, an instance in which their and our expectations are challenged. The unexpected, drastic tonal shift of the scene, which James MacDowell links to the “quirky sensibility” of the new American smart cinema, here takes on a narrative function, the switch to a more serious mood after the boy’s death reflecting the characters’ realization that they need to change as well (14-17). The characters’ immersion into the Ganges River, a life-giving body of water that has been revered by millions in India as a symbol of spiritual purity for over two millennia, becomes a symbol of baptism and renewal directly tied to the historical and cultural significance of the film’s setting. “Man becomes pure by the touch of the water, or by consuming it, or by expressing its name,” Lord Vishnu, the four-armed “All Pervading One,” proclaimed in the Ramayana, the Sanscrit epic poem composed four centuries before Christ (Hammer). This is not to say the scene is not problematic in its depiction and role of the three Indian boys. The first two are recovered safely, but Peter has trouble with the third. He emerges further downstream, carrying a limp body. “He’s dea—He’s dead,” he stammers. “I didn’t save mine.” The child becomes, in this dry formulation, almost like an object or a lost pet, and we must wonder whether he exists solely to provide impetus for these privileged white Americans. “Turns out that a dead Indian boy was all the brothers were missing,” Weiner writes. “This isn’t just heavy-handed,” he continues; “it’s offensive. 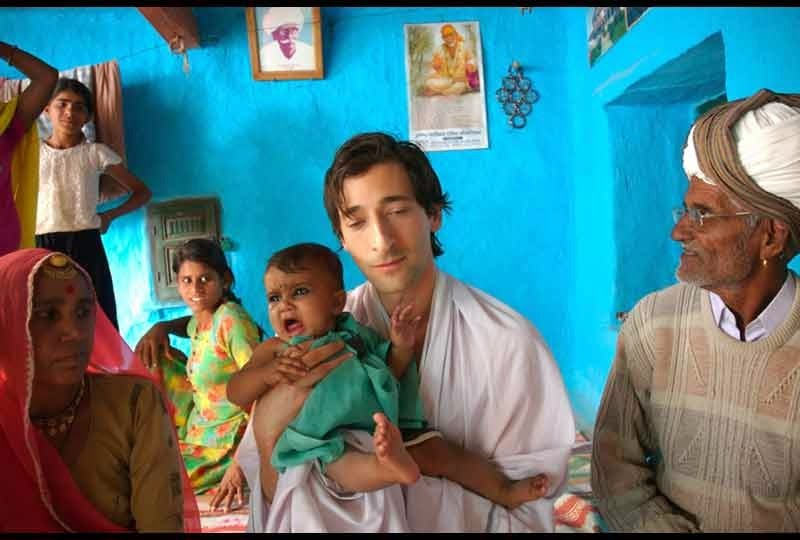 In a grisly little bit of developing-world outsourcing, the child does the bothersome work of dying so that the American heroes won’t have to die spiritually.” In this and other instances, Darjeeling has been harshly criticized for its flat, fetishized and romanticized depiction of India and its people as conduits or tools for white fulfilment; the brothers are going through something akin to a rehabilitation program with India serving as the clinic, and “an entire race and culture turned into therapeutic scenery” (Weiner). Critical literature on the road movie points out that the cultural significance of any journey is inextricably linked to the geographical and historical specificity of the traveled space (Eleftheriotis 101). The question has to be raised, whether Anderson is simply using India as shorthand for spirituality without ever engaging with the land or its people in any meaningful way. Is he mocking the brothers’ fetishistic attitudes or simply displaying his own? There are, moments—such as when Francis grandly declares, “I love these people,” seconds after a shoeshine boy has run off with one of his $3,000 loafers—or when Peter says, “I love how this country smells; it’s … spicy”—in which the irony-laced portrayal of the characters’ words and actions bespeaks a critique of the Western view of travel, and of colonialism itself, most obviously in the choice of Joe Dassin’s “Aux Champs-Elysee” for the end credits sequence. But the most significant way in which Anderson moves beyond simply using the people and culture of the film’s setting as a stereotypical, simplified, and caricatured representation of non-Western spirituality come in his depiction of the dead boy’s funeral. There is nothing funny or ironic in Anderson’s view of the Indian funeral, the entire ritual played, with almost surprising sincerity, for pathos. The scene prior to the funeral, in which the dead boy’s father bathes his body while the Americans wait for their bus, displays a seemingly sincere respect, and even admiration, for the proceedings. The level of artifice in Anderson’s style seems to drop momentarily as the soundtrack changes to incorporate quiet, realistic sounds of the natural environment. It is as if the whole movie takes a step back and waits in silence for the funeral to begin as the Whitmans start to interact with the Indian characters in an atmosphere of hushed, unhurried simplicity. This might be the longest stretch of any of Anderson’s works in which there is absolutely no dialogue and no hint of self-consciousness or ironic distanciation from the characters, their surroundings, or the audience. For the first time the brothers forego their usual attire in favor of traditional Indian clothing, starting to become immersed in their environment. Long tracking shots connect the Whitmans with the native community in mourning, and, when they get on the bus to leave and the dead boy’s brother comes after them to invite them to stay for the funeral, the camera zooms in on him in as it had done on the American brothers throughout the rest of the film. For the first time, Anderson is “looking” at the Indian characters the same way he has his protagonists. They are all on the same plane, no longer separated through the framing, cutting, or, as in the scenes at the temple or on the train, production design and physical placement of the actors within the frame. When Francis stoops to tell his brothers that they are invited to the funeral, he again addresses the camera directly, as he did when he explained his expectations of the Whitman’s trip. This time however, the gesture doesn’t seem as self-conscious, and it definitely is not played for laughs. Perhaps this is Anderson’s way of including the viewers into the proceedings of the Indian ritual and inviting us, as well, to participate as quiet and respectful observers. The Indian funeral and that of the Whitmans’ father are combined as the director flashes back to a year prior, cutting from a three-shot of the brothers in India, dressed in white, to the near negative-image of the scene, an identically framed shot of the three characters, all in black, on their way to the American funeral. The differences between the two settings is stark, the funeral in India bright, open, and inclusive in comparison to the tense and almost claustrophobic scenes of the Whitmans in the car and the dealership on their way to bury their father. We never see this funeral, instead only getting a glimpse of the brothers driving there. Peter insists on picking up the father’s car at Luftwaffe Automotive before the funeral, frantically trying to restart the red Porsche even though the battery is dead, an obvious attempt to not let go of his father. All three brothers want desperately to go to the funeral in their father’s car, asserting that it has to be done that way; they are clinging to the significance and security of objects and rituals to create the illusion of control. In contrast, the Indian funeral flows naturally and offers a much stronger sense of closure and fulfilment, the moment suggesting an emotional undercurrent that binds the brothers with the villagers through grief (Stephenson). It is interesting to note that most everything throughout the movie is only presented in bits and parts, and often portrays characters in motion. The film starts with Murray in the car, then moves to the train, from which the brothers are soon evicted, includes the incomplete memory of the father’s funeral, the car ride and the failed resurrection of another car, finally ending as the brothers board another train—it is clear the characters find themselves in a state of in-betweenness, of arrested development, unable to move on or even to adequately mourn their loss. Characters haunted, if not stunted, by mourning are a hallmark of Anderson’s work, but in Darjeeling, more than any other of the director’s films, we are able to discern the characters’ progression towards fulfilment, a process that significantly involves the formation of a new community. The only event we witness from beginning to end is the Indian funeral, which starts the Whitman’s healing process and links them to the native villagers. The Kinks’ “Strangers” hints at the characters’ embracing of uncertainty and a new way of thinking (“I’ve killed my world and I’ve killed my time/ So where do I go, what do I see?”), respect for a different, pointedly less selfish, materialistic, and individualistic way of life and a sense of connection with the Other (“So I will follow you wherever you go/ If your offered hand is still open to me/ Strangers on this road we are on/ We are not two we are one… So we will share this road we walk/ And mind our mouths and beware our talk/ Till peace we find tell you what I’ll do/ All the things I own I will share with you/ If I feel tomorrow like I feel today/ We’ll take what we want and give the rest away/ Strangers on this road we are on/We are not two we are one”). Francis, Jack, and Peter must open themselves up to the Other in a way that goes beyond mere surface and recognize the humanity and subjectivity of the people surrounding them. “To recognize the other,” Lingis writes, “is to respect the other” (23). The author makes a distinction between a depth-perception and a surface-sensitivity to the other. Depth-perception extends beyond a superficial encounter so one can envision “the road the other has traveled, the obstacles he has cleared, the heat of the sun he is fleeting” (23). To recognize and accept these things is to begin to understand another person in his or her own environment and to accept and embrace the experiences he or she has lived through and try to see the world from the other’s point of view, not only through its position in the physical world but through a deep engagement with a different cultural coding that is inseparable from this perception (24-29). It is at this level that the characters can start to understand and connect with the suffering of another, which can only be grasped when one gives oneself over to abandon and vulnerability, not to control or change it but simply to partake in it, as they do in the funeral scene. “This sensitivity extends not to order the course and heal the substance of the other, but to feel the feeling of the other” (31). This encounter is always disruptive and, hence, transformative: the other’s “approach contests my environment, my practicable layout, and my social arena…. Her approach commands an understanding that arises out of the sensitivity that is afflicted by her suffering” (34). The formation of a community with the Other goes beyond the obligations implied by kinship, a kinship that extends past family resemblance to incorporate not only one’s lineage, but one’s clan, people, or race. Beyond the recognition of kinship with those who are like oneself there is another kind of community, the brotherhood of individuals who possess or produce nothing in common, “individuals destitute in their mortality” (Lingis 157). This community is real not in the exchange on insights, directions, or resources, but of the life of different individuals, a community in death. To create this kind of community, “we should have to find ourselves, or put ourselves through imagination, in a situation at the farthest limits of kinship—a situation in which one finds oneself in a country with which one’s own is at war, among foreigners bound in a religion that one cannot believe or which excludes one, with whom one is engaged in no kind of productive or commercial dealings, who owe one nothing, who do not understand a word of one’s language” (Lingis 157-58). The description above is strikingly similar to the situation the Whitman brothers find themselves in throughout The Darjeeling Limited. But, despite all odds, by the end of the film Francis and his brothers have managed, clumsily and perhaps unexpectedly, just what they set out to accomplish, a spiritual journey. “I guess I still have some healing to do,” Francis ventures after he unwraps his head and the three characters study his battered face in a bathroom mirror. “You’re getting there, though,” Jack says, while Peter comments, “Anyway, it’s definitely going to add a lot of character to you.” The obvious couching of emotional ailments in terms of physical scars notwithstanding, these statements stand true in regard to all three protagonists. The Whitmans still have some healing to do, but their pilgrimage has served as an awakening to the need for change. Like all of the flawed but ultimately redeemable characters of Anderson’s work, the Whitman brothers start off their typically narcissistic journey concerned only with their singular, superficial, stubborn, and selfish vision; eventually, they learn to channel and their actions to move towards collective fulfillment. Traveling encourages the characters to look inside themselves even as they relinquish their individuality and need for control to become part of a group in mourning and align more closely with the environment. Moving away from Western rationalism and materialism, they undergo a journey of exploration, discovery, and revelation not only of the world, the land, and its inhabitants, but also, fundamentally, of the self. 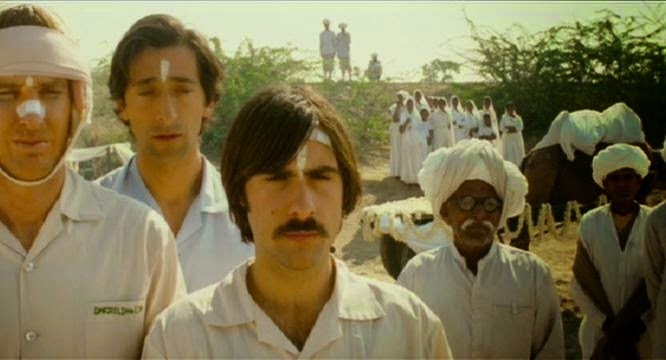 The Royal Tenenbaums and The Darjeeling Limited.” New Review of Film and Television Studies. 10.1 (2012): 118–31. World. Bloomington : Indiana University Press, 1993. Print. thesis, Carleton University, 2009. Web. Review of Film and Television Studies 10, no. 1 (2012): 132–51. Hammer, Joshua. “A Prayer for the Ganges.” Wordfocus.com. Web. 9 Dec. 2014. Change. Oxford, Blackwell, 1990. Print. Nooteboom, Cees. Nomad’s Hotel: Travels in Time and Space. London: Vintage Press, 2007. Existential Space in Cinema: 13-36. Helskinki: Rakennustieto, 2001. Sallis, John. Topographies, Bloomington and Indianapolis: Indiana University Press, 2006. Print. Anderson Movie.” Slate, 2007. Web. Films of Wes Anderson: Critical Essays on an Indiewood Icon. Ed. Peter C. Kunze, 25-38. New York: Palgrave Macmillan, 2014.